I believe we have a policy of no recruiting from Apple and this is a direct inbound request. Can you get this stopped and let me know why this is happening? I will need to send a response back to Apple quickly so please let me know as soon as you can. On this specific case, the sourcer who contacted this Apple employee should not have and will be terminated within the hour. We are scrubbing the sourcer’s records to ensure she did not contact anyone else. In general, we have a very clear ‘do not call’ policy (attached) that is given to every staffing professional and I reiterate this message in ongoing communications and staffing meetings. Unfortunately, every six months or so someone makes an error in judgment, and for this type of violation we terminate their relationship with Google. Apologizing and groveling to Steve Jobs is a recurring theme throughout these court dockets... as is the total disregard for all of the not-Steve Jobs names whose lives and fates are so casually dispatched with, like henchmen in a Hollywood film. Appropriate response. Please make a public example of this termination within the group. Please also make it a very strong part of new hire training for the group. I want it clear that we have a zero-tolerance policy for violating our policies. This should (hopefully) prevent future occurrences. 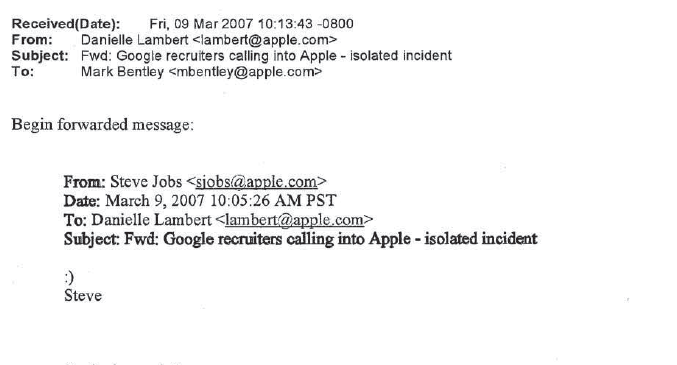 An hour later, Jobs forwarded Eric Schmidt’s email to Apple’s head of HR, Danielle Lambert, with a simple, but brutal, two character response to news that a Google employee had been summarily fired. Under questioning, Brin alternated between cocky nonchalance, and sudden bouts of convenient forgetfulness. [Heimann]: So the question is this. I had asked you earlier about whether or not Google enforced the policy, and with respect to these documents, these appear to be instances – this appears to be at least an instance in which Mr. Jobs complained about what he thought was recruiting going on on Google’s part among Apple, or Apple employees, right? [Brin]: That’s what it appears to be, yes. [Heimann]: So the question is, were you made aware of these kinds of complaints when they came in? [Brin]: Well, I am on the cc line of this particular email, so you know, I don’t really recall it, to be honest with you, nor have a recollection of it at all. But somebody thought to copy me, it looks like. [Heimann]: Yes, I see that. [Brin]: No, sorry. At this point in the deposition, Heimann shows Brin the March 9, 2007 email from Eric Schmidt to Steve Jobs, assuring Jobs that the Google recruiter Jobs complained about had been summarily fired, and that it won’t happen again. [Brin]: Wow, Steve used a smiley. God, I never got one of those. Update: More Steve Jobs emails reveal how he prevented Google from opening an office in Paris. Pando attempted to reach Arnnon Geshuri via Tesla but the company declined comment. An email to Shona Brown [2+hrs ago] had not received a response by press time. We will update this story with any subsequent comment we receive. Correction: An earlier version of this article gave the wrong title for Judge Lucy Koh.